Sarah Nader- snader@shawmedia.com Dr. Timothy Stirneman fits Joe Hathcoat, a truck driver suffering from severe sleep apnea with an oral mouthpiece that will hold his jaw forward allowing him to have a larger airway at All Smiles Dental in Algonquin Tuesday, December 17, 2013. The mouthpieces are used for those with sleep apnea who can't tolerate the large breathing masks that must be worn at night. Sarah Nader- snader@shawmedia.com Dr. Timothy Stirneman (right) talks with Joe Hathcoat, a truck driver suffering from severe sleep apnea before fitting him with an oral mouthpiece that will hold his jaw forward allowing him to have a larger airway at All Smiles Dental in Algonquin Tuesday, December 17, 2013. The mouthpieces are used for those with sleep apnea who can't tolerate the large breathing masks that must be worn at night. Sarah Nader- snader@shawmedia.com Joe Hathcoat, a truck driver suffering from severe sleep apnea gets fitted with an oral mouthpiece that will hold his jaw forward allowing him to have a larger airway. The mouthpieces are used for those with sleep apnea who can't tolerate the large breathing masks that must be worn at night. 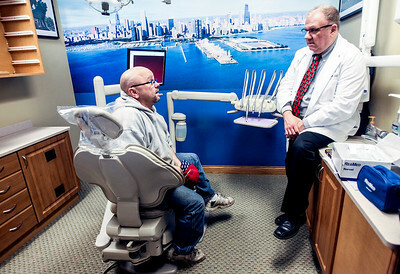 Dr. Timothy Stirneman (right) talks with Joe Hathcoat, a truck driver suffering from severe sleep apnea before fitting him with an oral mouthpiece that will hold his jaw forward allowing him to have a larger airway at All Smiles Dental in Algonquin Tuesday, December 17, 2013. The mouthpieces are used for those with sleep apnea who can't tolerate the large breathing masks that must be worn at night.